I've searched through my pictures to create a Seoul shopping post, but sadly I didn't take too many, nor did I find a lot of places that tickled my fancy. Sorry this post took so long. It's not very full like the Hong Kong shopping since I don't find a lot of things that interest me here. Let's start with the infamous Myeong Dong (명동). I think I can call this my second home because I'm there almost every weekend. Myeong Dong is like a shoppers dream, especially if your coming from North America with the USD and CAD. Most of the stores are clothing, makeup and cafes. If you happen to go during a Friday or Saturday night, you might notice a ton of police officers lined up with shields and running about. They're there to prevent protests from going overboard and these protests happen quite often in MD...not too sure what they're about. MD is quite easy to get to because it's in the heart of the city. You can get there by 2 different subway lines. The easiest is just going to Myeong Dong Station. If I tell you to go to Euljiro 1 Ga, you might get lost, so I'm gonna skip that. It's easy to get lost at MD, so I'll try my best to direct you through it. When you get to the station, you need to take exit 5/6. Once you head up the stairs you'll see a Migliore and Tabby shopping complex. Both are filled with a lot of small clothing and accessory stands. Migliore is definitely the bigger out of the 2. If you're ok with crowded shopping, then these complexes are for you. They look very wholesale-y and a bit run down at times (imo) and I find that it's difficult to find something I like. I don't really like searching through each store to get something, especially if they usually carry 1 size. I think the sizes for the tops are usually between a small and a medium and most of the time they're fitted on me. I've only shopped there maybe 2-3 times. After Migliore, you can head out and start swimming through the crowd of people. I'll have to direct you this way: stand outside so Migliore is to your left and Tabby is to your right. On the first intersection, if you turn and head left you will find a big Gap, Giordano(a HK clothing store) and Uniqlo. While you're walking towards Uniqlo, you should see a small street to the right and there's a lot of cheap accessory and clothing stores there. If you look right across from Uniqlo and a little bit to the left, you will see some ice cream dispensers, that's where I got the 30cm ice creams for 1000won. But be warned, they don't taste like proper ice cream. If you look across Uniqlo and towards the right, you'll see a Beauti Plex and a Hello Kitty store. I don't think a lot of people go into that Beauti Plex. I've only been once and none of the cosmetics really interest me. When you start walking back to the intersection where Migliore is, on the left you should see the Kraze Burger. It's right next to a hotel. You should give it a try I think it's pretty tasty, plus this Kraze Burger has drinks included. One of the Kraze Burger exits leds to the Mother's Crepe store, you should go! One more food place to go to is Nolita. It's a pretty good Italian restaurant that's got a nice atmosphere. If you're facing Kraze Burger and the hotel, Nolita should be a few steps to the right on the second floor, so keep your head up. Now if you go back to where you started when you stood in between Migliore and Tabby, instead of turning left towards Gap, to the right there is a Mister Donut cafe, Olive Young (Korean drugstore) and I believe a Sakuten restaurant. Continue walking past Mister Donut and you'll see a smaller street to your left. If you decide to talk on that street, you'll see a Forever21 and Kosney to the left. Across from the plaza where F21 is, you should be able to find the Orbis store. You can continue down this street and eventually you'll see an ABC Mart in front of you. I'm gonna start directing you again from the starting point where Migliore is. This time, if you walk straight, you'll walk right into the most crowded area of MD. As you walk along this crazy street, to the right you should see Tony Moly, 2 Hanskins, Etude House, Forever21 (the otherside of the complex) Kosney and Zara. To the right you'll see Banila Co, Aritaum, and Laneige. There is a new store that opened called Baviphat. Weird name... but anyway, they use Beyonce as the model, but it kinda doesn't look like her. The store sells cosmetics and skincare and they look like a cross between Benefit, Lush, Etude House and Banila Co. They're really cheap too! Not sure how long this store will be around because stores tend to change very quickly here. If you happen to want to go to Lush, I can try to direct you. It's a bit complicated. OK, start back at the Migliore/Tabby starting point. Walk straight and when you get to I think the 4th or 5th street, turn left and you should see a bath tub outside the window, unless you can already smell it. It's a small store and things are marked up quite a bit so I 've never purchased anything there. 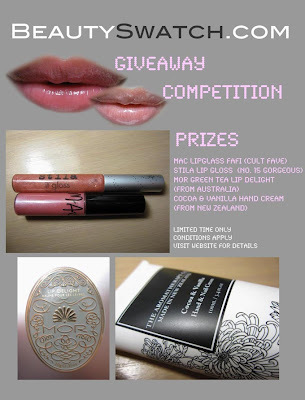 For example, the Honey Trap lipbalm is about $6USD, here it's 15,000won! I'll led you to Lotte Department Store then let you walk around yourself. There's too many things to go through at MD. Back at the starting point, if you walk all the way to the end of that street, you should see the Myeong Dong Theatre to the left in the corner and ABC Mart on the right. Turn left and walk to the end of the street and you'll see the Lotte Young Plaza, Avenue and Lotte Department Store! Next place to shop is at Ewha Women's University. This place is filled with university students, duh.. Haha.. there's a few universities at the nearby stations. When I first walked around this area, it was really nice and had almost a cafe street cozy-ness to it, especially on the street right in front of the university. BTW, if you get a chance, take a walk around the university, it's gorgeous and huge! **First a warning about the clothing stores around here. I find that most of them are owned by men and they're very rude to foreigners, at least what I've experienced. When I shop, I always ask for the price before trying anything on, especially because nothing has a price and the store owners set it depending on whether you're a foreigner. I went shoe shopping and asked the man how much it was. He kept insisting for me to try it on and wouldn't tell me the price. I didn't want to try it on so I put it back on the shelf and started to walk away. Then I heard him say in Korean "go away" very rudely. When you get to the station, look on the map to find Ewha Women's University. I can't remember the exit. There's a lot of unique stores around here and lots of streets for you to walk through. I'm just going to tell you the main path I take when I go there. Once you get out, you should see a Rimini Italian Restaurant. It's mediocre, but they have set meals for 2 people if you happen to have a friend. When you exit the station and see Rimini, the big road should be on your right and you should see a slope to the left leading towards the university. Turn left and you'll see a bunch of stores. A few steps forward and you'll see the Yes Apm shopping complex to the left and marion crepe on the first left. The Yes Apm is similar to Migliore, but this one is a lot less crowded. If you continue straight, you should see a Watson's, Kesalan Patharan, Faceshop and Etude House to the right. Walk to the end of the street and you'll be at the entrance/gate of the university. Look to the left of the gate and you should see a Nolita Italian restaurant on the second floor and a small street that looks kinda like an alley. Don't miss that because there's some nice clothing stores back there, but keep in mind that almost all the clothes are one size fits all. When you start walking to the left of the main gate, you should see a giant pink shoe and that's the entrance to Kosney and some clothing stores at the top. The clothes are usually on sale, it includes Codes Combines but I can't remember the other brands. If you keep walking left past Kosney, you'll see a Hanskin and Smoothie King across the street. Walk towards Smoothie King and you should see a street that goes to the left, that's where most of the shoes are sold. If you walk straight past the shoe street, there's another shopping complex to the right which I haven't been in. You should also see Sinchon Station by the shopping complex. If you go back to the subway station, you can take the subway to Hongdae Station. That's where a lot people people supposedly goes for clubbing. There's also a lot of unique clothing and accessory stores there. I got my most recent necklace purchase at a street stand by Hongik University. I haven't really been there enough times to direct you properly, especially because there are no street names that I can use. You just gotta look at the subway map of where Hongik University is and you'll be fine. It's like a maze there almost. 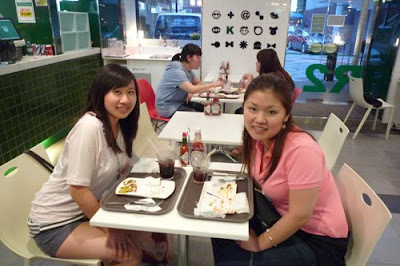 If you're lucky, you'll spot the DHC store, Freshness Burger and Mongolian Hotpot. If you like the touristy spots, you should definitely go to Insadong. Insadong is not a station, you can get there by going to Anguk Station, Jongno 3 Ga Station or Jongak Station. I can't remember which one is closer, but I usually take it to Anguk Station and look on the map. Once you get there, you'll feel like you're in a traditional looking area that sells touristy souvenirs. They're not like super cheap, I'm sure you can get most of the souvenirs elsewhere for a cheaper price. The area is kinda small, you can finish walking around in maybe 2 hours. Insadong has a lot of tea cafes and supposedly one that has birds flying around in it. I haven't been to that one yet. Actually, I've only been to Insadong about 3 times. It doesn't have the things I want to buy, but if you like the traditional Korean goods then take a look. There are plenty of Ho Bars around. If you see the flourescent lights in the back streets with signs saying Hof, Soju or Beer, you're likely to find a Ho Bar. I haven't been, but I hear it's decent if you're into bars. Ho bar got the name from the Chinese word 好. If you like bars then the area around Insadong/Jongno 3 Ga is probably where you'd like to go, other than that, it's quite boring imo. But for better bars I'd direct you to Gangnam or Hongdae. Co-Ex Mall: Go to Samseong Station on the green line. I can't remember which exit it is, but the mall is pretty much connected to the subway. If you can't find it, look on the subway map or try and ask someone. This mall has Kraze Burger, an Aquarium (sadly with small living quarters for the mammals), a Kimchi museum, Pepper Lunch (terrible in Korea, better in HK), and a movie theatre. This mall is connected to a bunch of areas including the Hyundai Department Store, so I'd recommend maybe an afternoon of walking time. There is also an Enter-6 plaza inside. It's like a large store that has a lot of smaller stores inside. Dongdaemun: Dongdaemun Station or Dongdaemun Stadium Station should get you to the cheap wholesale-ish shopping complexes. I personally don't like shopping at the stores in Dongdaemun because the store owners are often rude and I feel they look down on foreigners. I also can't find my sizes there, just like the Migliore in MD. They tend to lean towards the small to medium sizes and even if I can wear them, I don't like the fitted-ness of most clothes. Dongdaemun has 3 main shopping complexes for clothes that you'll want to buy. Migliore and Doota are 2 of them, I can't remember the name of the other one. I won't be able to direct you to the shopping complexes because I can't even direct myself. I usually go by where I think it was and end up finding it. You can always ask someone or look on the subway map. Other than the 3 shoping complexes, Dongdaemun has a lot of wholesale markets, which I don't find interesting. Ipark Mall: This is at Yongsan Station and it's connected to the electronics plaza. Yongsan has I believe 5 levels but there are not a lot of stores on each level. There's a movie theatre and a department store, I think it's called the Ipark Department Store. That's where I got my Lunasol base makeup set from the nice lady. It's not really crowded in the mall and it closes around 8pm. I don't think there's much to shop, except for the stores inside the department store. Just a warning, if you are looking for electronics, don't get them at Yongsan. They rip people off and all the men SAs are so perverted! Enter -6: This is a rather small shopping plaza/mall. It's the same as the one inside the Co-Ex Mall except this has like 3 levels to it and it's a lot nicer. It's located at Wangsimni Station, just go up the escalators and you'll see it. It's got a nice atmosphere and a lot of stands outside the stores with the sale items. Whenever I go, a lot of the workers there are in some sort of masquerade themed costume. It's got a movie theare, Banila Co and 2 buffet restaurants called VIPS and Marisco across from E-mart (it's all the way at the top of the escalators). I've been to VIPS and it's about 25,000won per person. It's pretty good considering they had smoked salmon the last time I went. The E-Mart here has Integrate, Faceshop, Skinfood and Etude House. Although there are a bunch of clothing stores here, I wouldn't recommend you to go out of the way just to go to this plaza/mall as you might be disappointed at the size. I'm not too fond of shopping in Seoul, aside from the cheap and rare Korean cosmetics like Hanskin, Skinfood and Etude House. Most of the clothing or shoes aren't really the styles I like. I much prefer the styles in Hong Kong or something like Aritzia's style or the girls from Vivi magazines, that's why this shopping guide isn't as comprehensive as the Hong Kong one. I would definitely recommend you to go to Hongdae to find the handmade accessories, Myeong Dong and the Co-Ex Mall if you happen to go to Seoul, but anywhere else, is kinda "meh" to me. A few weeks ago, I left a comment somewhere that my hair was breaking and falling out more than usual due to the water in Korea..I can't remember who's blog it was. Anyway, Mika (Beauty Snap) had read it and she offered to send me some shampoos that might help give my hair a boost of goodness. The water in Korea is difficult to create a lather and it's just weird water imo....I think I said this already. Mika sent me some DHC shampoo/conditioner, Tsubaki White shampoo, Kracie hair treatment, Fekkai protein treatment and a styling cream. I'm eagerly awaiting bedtime to try the Fekkai sample haha. I'm so weird. She's such a sweetie, I didn't expect her to send so much too! Thankq!! I just used the Kracie hair treatment. I left it in my hair for about 4-5 minutes and omg, my hair is so smooth. Smooth enough that I can run a comb through it while wet and my hair didn't tangle at all. Thankq again Mika! Just watch out now XD BTW, her writing is so neat. I got a Skinfood cleanser for Tim to use, it's the Tea Tree Cleansing Foam. After Tim used it once, he was like "it smells like tar!" I opened the tube to take a sniff, but I could only smell like tea tree/woody smells. I tried this the next day and holy crap...it smelled like I was using asphalt on my face, gross!!!!!!! I didn't use it again so I can't let you know how well it washes. I just wanna warn people that this smells so bad!!!!!! *sigh* Skinfood cleansers have been a hit or miss for me. I'm still using the Laneige Pore cleanser (blue tube) so I don't have to suffer with asphalt smelling skin. But I'm hating the Laneige cleanser right now. The smell lingers too long and it's so strong, I don't even know why I repurchased it. Waiting to finish it so I can try the Hanskin ones. I can't seem to finish my Seoul shopping guide. There's just too much to write, I didn't expect to take this long....trying!! I've been terrible and neglected blogger haha. I officially have 8 more weeks in Korea and then I'm flying back home! This week was the last time I teach something from the textbook, or teaching a useful lesson, so I've just started to feel slacker mode kick in...even for blogging. I've finally booked my tickets for Hong Kong and Japan and I'm so excited! I'm going to Hong Kong from July 31-August 10, then August 11-16 will be Japan. Weee!!! But I haven't even booked a hotel in Japan yet puhaha. 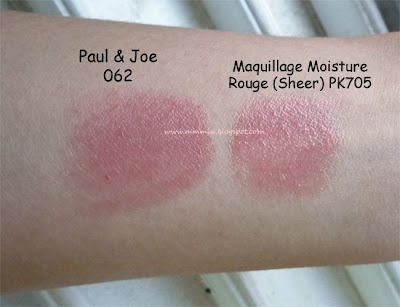 After trying the sample of Maquillage Moisture Rouge in PK705, it's been on my wishlist for sooo long!! I gave up in saving my money and purchased it over the weekend. I went to the Lotte Department Store 2 times before finally getting it. I would have gotten it eventually in Korea or in Hong Kong, it just so happens that it's slightly cheaper here due to the exchange rates with the KRW and HKD. This was 35,000won for 4g. 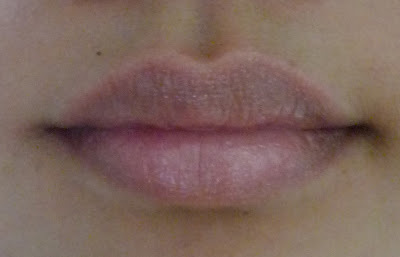 Prior to purchasing this lipstick, I've been using the P&J 062 shade which is like a "my lips but better" color. The Maquillage lipstick just kicked P&J off its winner pedestal. But P&J still has part of my heart because the design on the lipstick is too cute and it's smells so nice. 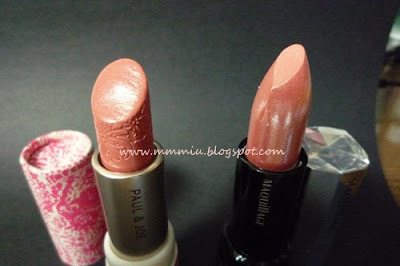 Although the 2 shades look very similar in person, the Maquillage lipstick has a lot more shine/shimmer. It's so shiny!! The lipstick is super moisturizing and smooth. I think it's smoother than the P&J lipstick. 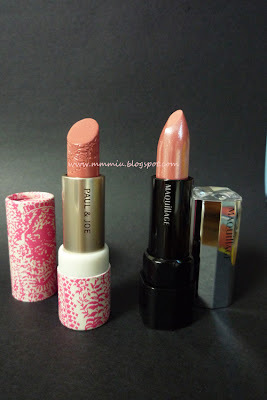 Whenever I use the P&J , I use a lipbalm to help the lipstick go on more smoothly, but with the Maquillage, I didn't need to use a lipbalm all the time. Even though this shade is in the Sheer category, I think the color pay off is excellent for a sheer shade. As for lasting power, I'd probably give it about a 3/5. I didn't notice as much shimmer after 1-2 hours, boo! 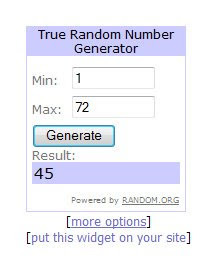 Here's my entry for the Beauty Swatch Giveaway. I never do LOTDs just cuz my lips are too pigmented to really show anything...and I don't know how to take a nice picture!! XDXD I'm wearing the PK705, current fav! You gotta watch this and the rest of the videos!! Yumyum!!! 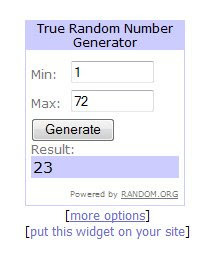 I'm gonna make you read through everything before getting to the winners!! Or at least skim through the pictures hehe. I had a meet up with Kay from Bihada Diaries on Sunday, she wasn't able to make it last time due to the swine flu warnings. Anyway, I had so much fun!!!! Kay is such a sweet girl. I rarely get any girls day out anymore. The last time I did was when I met up with Beauty Addict and Aichaku about a month ago. Come to think of it... I think these were the only times I had a girls day out. 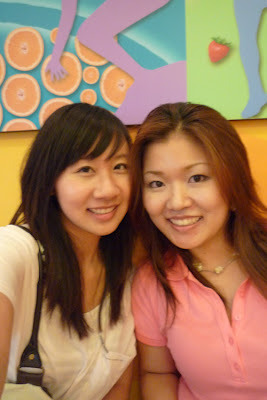 Kay and I went to Myeong Dong to do some major shopping. She thought she could scare me with her huge shopping list haha. We stopped by Donut Plant to get some more shopping fuel. 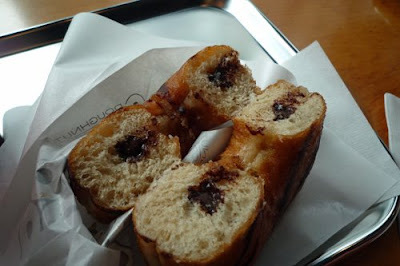 I had a vanilla choco donut while Kay had a banana walnut choco donut, so yummy. After all the shopping, we at at Kraze (pronounced Kra-zay) for dinner. Don't you love how we take a picture AFTER eating the food? The funniest part was, I didn't buy a lot. 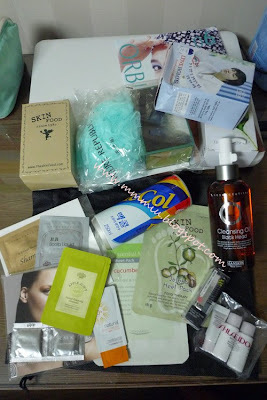 I only got a Hanskin O2 Cleansing Oil Black Head, a Skinfood Jojoba Heel Pack (for Tim's foot) and the Maquillage Moisture Rouge in PK705 (sheer). But I still ended up with this mountain of stuff. Everytime the SAs standing outside the stores offered stuff to us, Kay and I would grab it and walk in a quick circle in the store. Love it. I got more cotton pads than items I bought. Kay gave me a gift!! 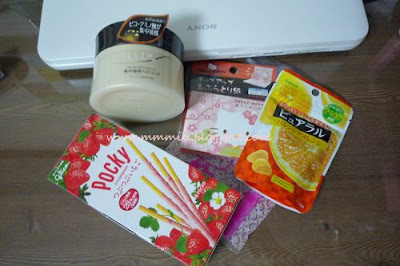 She gave me a Lux conditioner, Pocky (yumyum), orange gummies and a super cute pop-up Hello Kitty blotting paper!!! The pocket will be gone tonight...do I hear dessert? Thanks again for meeting up with me Kay!! I hope to see you again in Japan, along with some more fellow beauty bloggers. 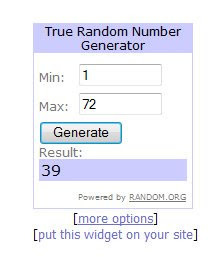 Time to announce the winner!! I got so many entries! 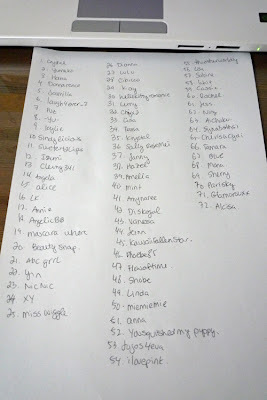 Thank you to all who joined, I had fun reading your HGs. Nicnic from Daily Beauty Buzz!!! Congrats! I'll send you an email shortly, even though I still have your address hehe. KawaiiFallenStar from Shan Shan Style I'll send you an email shortly. Amelia from Feel The Amelianess I will email you shortly. Thanks again to all who participated and to all my readers!! Love yous! 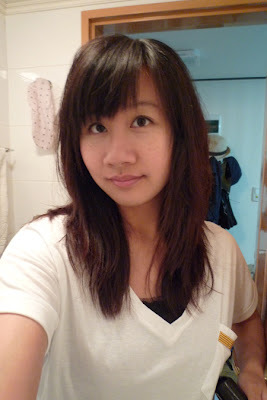 I cut my hair yesterday. My bangs were getting too annoying. If you've ever been to Seoul to cut your hair, you might have noticed the chain hair salon called Juno Hair. They're considered expensive to most people, but I think it's really cheap. The one I went to is at Wangsimni Station and they are super nice. 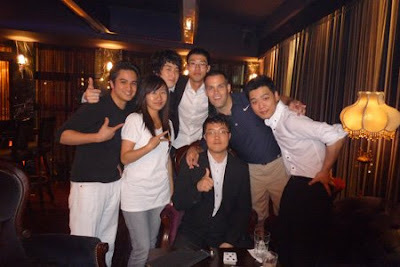 Even though I had a hard time communicating with them, they seem very fascinated by foreigners. Tim goes there to get his hair cut and this was the second time I went there. Sometimes they offer you some drinks and snacks. It took like 10 minutes to explain to the girl how I wanted my hair. I basically just wanted my bangs a bit shorter. It cost 25,000won but I had a membership card so I only paid 22,500won. You don't pay tips either. I don't think this picture really looks like me haha. I never realized how long the back was. 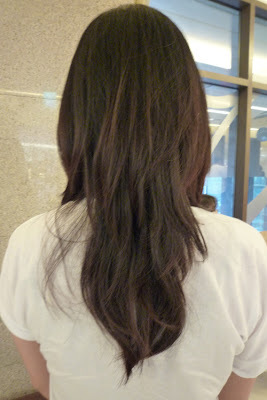 I got this back picture taken at the salon where they attempted to make my hair wavy and flowy. Update* 22,500won should be about $18USD. You have about 22 hours left till the end of my contest! Link is on the left column. I went to Hongdae for dinner at an Indian restaurant called Yeti. It's got a really nice atmosphere. You sit on the ground with squishy pillows and watch (I'm assuming) Bollywood music videos. The restaurant is dimly lit so I think it's a nice romantic place to go. 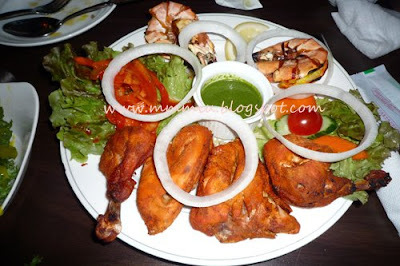 Tim and I ordered the dinner for 2 set and this was part of our dinner... Tandoori chicken and shrimp. I couldn't resist buying something from Hongdae. 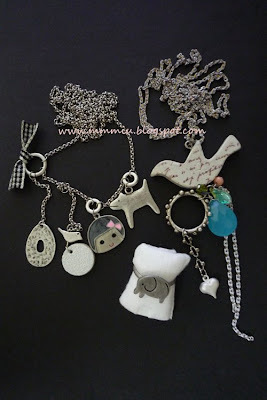 There are a lot of stores that sell one of a kind pieces that are hand made. I saw these necklaces at a street stand and they were too cute to pass up! They were originally 17,000won each, but since I got 2, the seller discounted it to 28,000won for both. They're super pretty! I hope this inspires some jewellery makers out there! Oh, the seller also makes really cute head bands and hair clips, gonna take a look next time! OMFG!! I didn't realize that I wrote July 19 for the HG contest instead of JUNE 19!!!!!! I'm gonna extend it till June 20 midnight Seoul time! @___@ Please enter!!! =D=D Thanks to AngelicBB for noticing this!!! haha. I went to Myeong Dong yesterday...on a weekday to meet up with Tim and a friend. I got there earlier so I decided to drop by Hanskin to get a conditioner. My hair has been breaking very easily and I loose a few too many when I blow dry my hair. According to the Hanskin website, the "Bring Back Conditioner" is supposed to help moisturize, detox, add nutrients, help hair growth and prevent hair loss. That's according to the pictures haha. When I purchase a conditioner, I expect it to make my hair silky without weighing it down (I have fine hair). I want to be able to run my comb through while my hair is wet without any knots and it also must make my hair silky after blow drying. 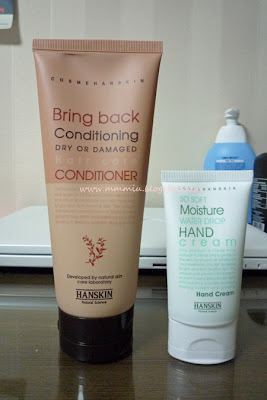 So... with that said, I don't think the Hanskin conditioner lives up to these expectations after using it twice. The Herbal Essence one I was using did a better job. As for the hair growth part, I have yet to see that happen since I just started using it. I will probably continue buying this conditioner and use it in the morning because it doesn't weigh my hair down (that's the only plus about this). You know how most conditioners leave a silky feeling when you're hair is still wet? This one doesn't..the conditioner rinses out completely and there's no "conditioned" feeling. I only intended to get the conditioner during the visit to Myeong Dong, but of course being a girl...I ended up with more junk. 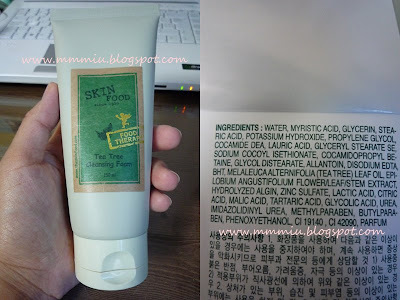 From Hanskin, I got their Moisture Waterdrop Hand Cream 40g for 5000won. A lot cheaper than the fruit shaped hand creams (30g for 12,000won). I asked for some BB cream samples and I'm gonna throw this into the contest. The hand cream is very funny. Have you heard of the Skinfood Lettuce Cucumber serum? Well it's similar to that...in the way that when you apply the hand cream, it kinda forms water beads then immediately gets absorbed into the skin. It looks kinda like you're sweating on your hands as you rub it in, it's so cool!! The hand cream has a light fragrance and doesn't feel sticky at all. As for moisturizing-ness, I think it's ok. It's not like Aveeno where it moisturizes my hands for a long time, but this is good for the price. 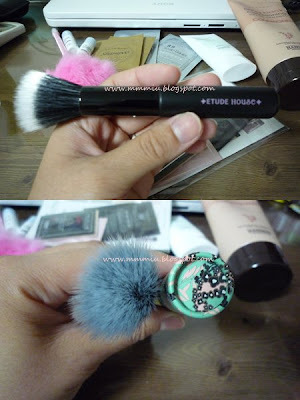 I went to Etude House because I was convinced by Old Cow that the dual fiber brush is comparable to MAC. I haven't felt the MAC one before, but this is quite a good brush for the price (8000won). It's really soft and dense, but it's so small!!!! 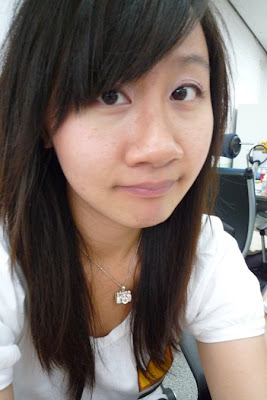 Trying to pull off a puppy eyes FOTD hahaha...I kept taking pictures of myself while all the teachers were teaching. There was a cleaner lady in the office who probably thought I was so vain. I'm using the Lunasol Soft Silver Lighting EX04 with MM pink cream shadow as a base. I finally tried Samgeitang!! (chicken ginseng soup). This was at Myeong Dong, supposedly famous restaurant, there's like 4 in MD. This was 10,000won and really filling and tasty! No bitter taste at all. I haven't eaten cantaloupes since Canada and I was so excited to see them here! But to my surprise, these aren't orange! 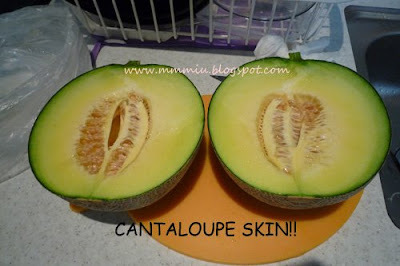 They don't even taste like cantaloupes, but it's got the same skin. Don't forget about my contest! Ends this Friday midnight my time (Seoul). Ning requested some shots of the newst Vivi. I thought they were kinda boring haha, but here it is! Not enough makeup bah! The stickers that came with the magazine are so strange. I'm not like a super fan of Hello Kitty, so the stickers don't really appeal to me. The strange part is the stickers are of the Vivi models..now where am I gonna stick these?? I tried to do a purple look, but failed miserbly...hope to try it again soon! How's everyone's weekend so far? I was home alone for most of Saturday while Tim had a day with the boys. I was going to go out with a few friends to a magic bar and I decided to take advantage of Tim's absence to do a video on applying my eye makeup for the night. I used the Lunasol Layer Bloom Eyes in purple gradation. I've already used this once in a previous post, so you can look there for pictures. I got the latest issue of Vivi. I'm starting to feel bored of the magazine because they don't show enough makeup imo...and because I don't have access to those kinds of clothes. Even if Korea had something similar, I probably won't be able to fit into it anyway because most clothes are one size fits all. This issue came with a booklet of Hello Kitty and Vivi model stickers. A new item that I haven't shown is the Muji blush in RKA. I can't remember how much it was since I got it back in February in HK. In the video, I used the MM mascara base, I only did it on one eye since I applied it to the another eye before the start of the video. I like how it helps prevent racoon eyes. Did you see what happened to my palette in the video!? Yesterday when I went, it was the bar's 1st anniversary. For some jokes and giggles, the guests had a chance to auction the magicians to their tables for some shows and company. There were at least 15 magicians, but most of them were guest magicians. My friend and I auctioned 4 magicians for a total of 53,000won. Not too bad, their tricks were amazing and these guys are quite the charmers. It's my second time there and I'm definitely visiting them one more time before going back to Canada. Their English is pretty good, so if anyone happens to go to Myeong Dong, make sure you hit up the bar! It's right across from the cathedral on top of Starbucks.